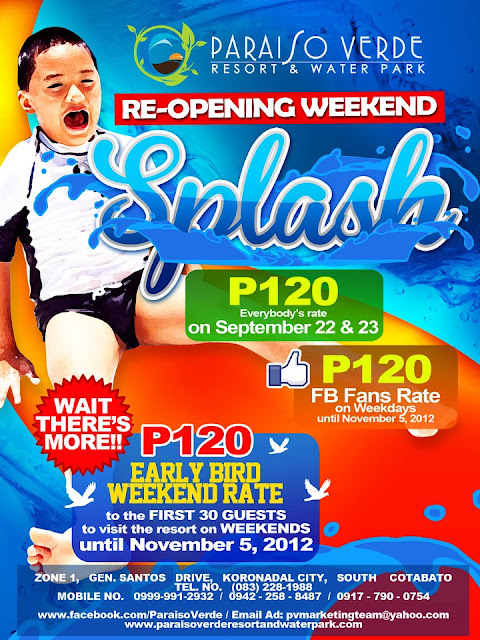 Paraiso Verde Resort & Water Park is back with a Big Splash! Paraiso Verde Resort & Water Park, home of SOCSKARGEN’s only wave pool, is back with a BIG SPLASH! The park re-opened last September 22 with newly renovated facilities and better services. With their promos below, guests may enjoy all of the park’s internationally designed water attractions for PURE FUN yet safe FOR EVERYONE. Some of these are the only one of its kind in the region so no more fuel charges and expensive rates when you go far. All these we can enjoy at home. MOBY WAVE POOL is the only wave pool in Socsksargen. It boasts of a 400 gallon bucket emptying into a 2,500 square meter wave pool. It is the signature attraction of Paraiso Verde. The pool’ depth is from 0ft to 4ft with no waves and up to 6ft with waves so even the kids can come and relax and enjoy the waves with their parents. WIGGLES KIDDIE POOL is a whimsically designed 600 square meter pool for children with water buckets of different sizes, play structures and exciting slides all for the kids and the young at heart to enjoy. The kiddie pool has a maximum depth of 2 and a half feet. FREESTYLE SWIM POOL is a COVERED 12.5 x 25 meter competition style lap pool with 6 lanes for the serious swimmers who do not want to burn their skin doing laps. The maximum depth of the lap pool is 4 ft. Games may also be done on this pool. A volleyball net may be installed as well as a pool soccer goal for the guests to play with. ADVENTURA RIVER RAPIDS is the fastest tube ride in town where guests are tossed along a 185 meter river loop with rapids faster than your racing heartbeat. It is truly an adventure worth riding. It has a maximum depth of 4 feet. This pool is under maintenance as of the moment. To complement the water attractions, Paraiso Verde Resort and Water Park’s Food and Beverage Facilities are equally exciting and always reasonably priced. Operated by CINCO NIÑAS FILIPINO CUISINE, we make sure our food is good, healthy and tasty. The AQUA CAFE serves fast food style entrées in big servings yet at very affordable prices. Mini packages served in “bilaos” for small groups may also be ordered for a hassle-free visit. Please see menu below. For your special occasions, Paraiso Verde has its now air-conditioned and glassed 300 square meter MAYA PAVILION that can seat up to 200 guests. Perfect for your wedding, a child’s swimming birthday party or your company outing. The park’s KAPIIOLANI GARDEN is the place to be if you want to have a party under the sun or the stars. The 2,500 square meter Kapiiolani Garden is the perfect al fresco venue. Whether it’s a Hawaiian Luau, a barrio fiesta, or a Jamaican Nights Party, this garden can take up to 250 guests comfortably. Think torches and firedancers! An addition to their venues is the LORO PAVILION, an open-air gazebo style structure for parties. This 400 square meter building can accommodate up to 320 guests. What are you waiting for? Make your occasions more special with the VIEW OF PARADISE! Paraiso Verde Resort & Water Park is located at Brgy. Zone I, General Santos Drive, Koronadal City, South Cotabato. For inquiries, call Paradise at +6383 228 1988 or +63999 991 2932 or you may email them at pvmarketingteam@yahoo.com.